After the fall of the Roman Empire, chaos and bloodshed swept across the remains of western civilization like a plague. Consumed by feudal warfare, Europe plunged into a centuries-long era of illiteracy and cultural desolation from which few historical records survived. Some believe that the true history of this dark age was deliberately concealed by its surviving scholars. Too incredible to be believed, too terrible to be retold. Hi! My name is Gary and I’m a screenwriter turned author. My best-known work is my original screenplay for The Book of Eli, the post-apocalyptic thriller starring Denzel Washington. I also co-wrote the Will Smith sci-fi movie After Earth, and helped create Telltale Games’ The Walking Dead, for which I was the co-recipient of a BAFTA award for Best Story. Most recently, I served as screenwriter for the upcoming Star Wars standalone film which will be released next year. Currently I’m writing the movie adaptation of the Mark Millar comic Starlight for 20th Century Fox. 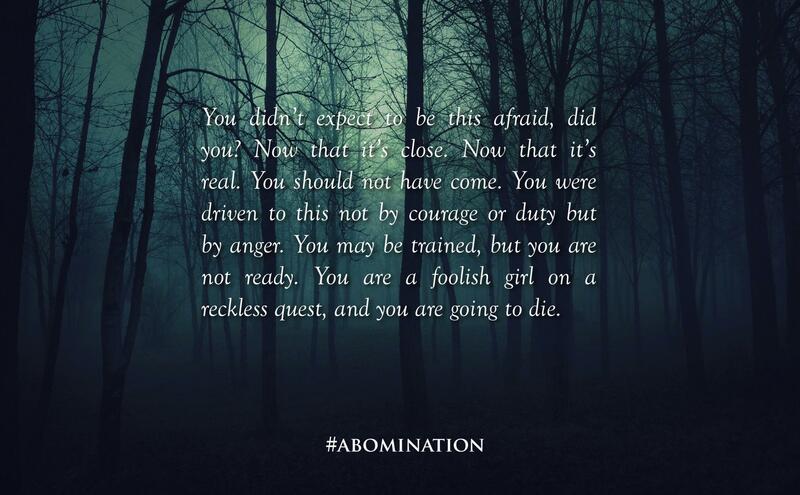 I can’t tell you how excited I am topresent to you my first novel, Abomination. I chose to writethis particular story as a book because I wanted to create a story that I couldpresent to an audience in its purest form. While a screenplay is the blueprint for something you hope many other people willtransform into the finished product that is a film, a novel is itself the finished product, an opportunity for a writer to tell their story directly to an audience. It’s been a really fun and refreshing experience to do that with Abomination. Set in England during the reign of Alfred the Great, Abomination has got magic, monsters, a heroic knight with a tragic secret, and a headstrong young woman on a vengeful quest. With Abomination, I wanted to combine the trappings of a good old-fashionedmonster yarn with more substantive human themes. At its core the story is, I hope, ameditation on the powers of forgiveness, mercy, humility, kindness, and love.It is the tale of two very different, but equally tragic, heroes, each on theirown path to damnation, but who ultimately find salvation within each other. Ihope you enjoy their journey together. The amazing Jason Gurley is designing the cover. For those of you who don’t know Jason Gurley, he’s one of the most talented cover designers around and also a damn-fine writer himself. Jason no longer designs covers but has agreed to come out of retirement (much like our protagonist, Sir Wulfric) to design the cover for Abomination. I’m excited to work with Jason on a final cover for the book in collaboration with readers. Abomination is fully written. Once funded, we’re going to do a quick copy edit, work on cover design (something we’ve held off on because we want to go through the process with our backers and readers) and get the book into your hands as quickly as possible. Hard copies will hopefully ship within a few months, with the digital version much sooner than that.